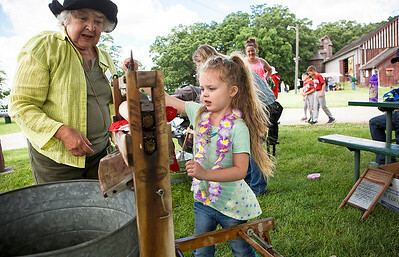 Mike Greene - For Shaw Media Layla Anderson, 5 of McHenry, uses a hand-operated clothes dryer during the 10th annual "A Day at Petersen Farm" Sunday, June 25, 2017 in McHenry. 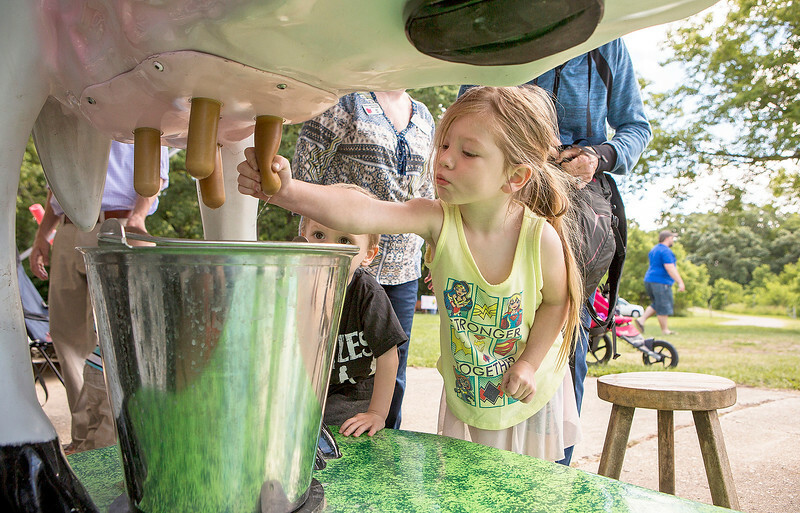 This year's event featured hayrides, farm animals, music and children’s games as well as exhibits showing McHenry County farm life in 1916. 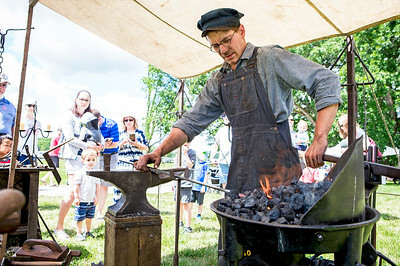 Mike Greene - For Shaw Media Sam Johnson, of Lakemoor, operates a blacksmith booth during the 10th annual "A Day at Petersen Farm" Sunday, June 25, 2017 in McHenry. 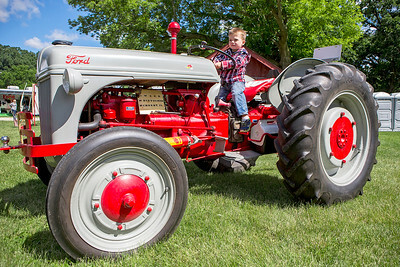 This year's event featured hayrides, farm animals, music and children’s games as well as exhibits showing McHenry County farm life in 1916. 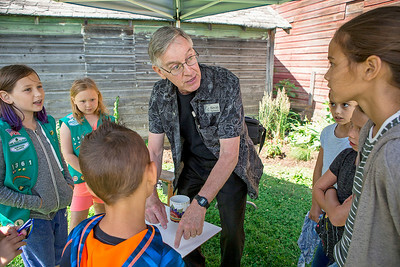 Mike Greene - For Shaw Media Kevin Sarnwick entertains a group of children during the 10th annual "A Day at Petersen Farm" Sunday, June 25, 2017 in McHenry. 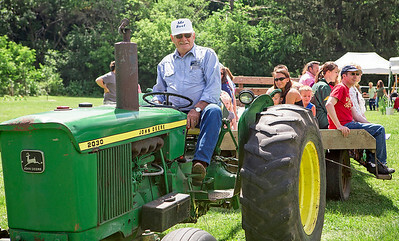 This year's event featured hayrides, farm animals, music and children’s games as well as exhibits showing McHenry County farm life in 1916. Mike Greene - For Shaw Media Thomas Stamatis, 3 of McHenry, tests out a 1941 Ford 9N provided by Walt Boettcher during the 10th annual "A Day at Petersen Farm" Sunday, June 25, 2017 in McHenry. This year's event featured hayrides, farm animals, music and children’s games as well as exhibits showing McHenry County farm life in 1916. Mike Greene - For Shaw Media Hazel Brozenec, 4 of Crystal Lake, tries her hand at an interactive cow exhibit during the 10th annual "A Day at Petersen Farm" Sunday, June 25, 2017 in McHenry. This year's event featured hayrides, farm animals, music and children’s games as well as exhibits showing McHenry County farm life in 1916. Mike Greene - For Shaw Media Vern Schiller takes a group of attendees out for a hayride during the 10th annual "A Day at Petersen Farm" Sunday, June 25, 2017 in McHenry. This year's event featured hayrides, farm animals, music and children’s games as well as exhibits showing McHenry County farm life in 1916. Hazel Brozenec, 4 of Crystal Lake, tries her hand at an interactive cow exhibit during the 10th annual "A Day at Petersen Farm" Sunday, June 25, 2017 in McHenry. This year's event featured hayrides, farm animals, music and children’s games as well as exhibits showing McHenry County farm life in 1916.